Edit an invoice if you made a mistake easily. You can edit items, billing info, discounts and VAT, and save changes when you're done. You can edit most of the invoice items directly in the invoice. Click on the item you want to edit and start typing. The line items will turn into editable fields. Once you're done with all the changes, hit the Save changes button in the bottom of the screen. Click on the Edit info next to a client to change a billing address or edit your own company details. Click on the Add line item if you want to add something to the invoice. You can add as many line items you want just don't forget to hit the Save changes button in the bottom of the screen. 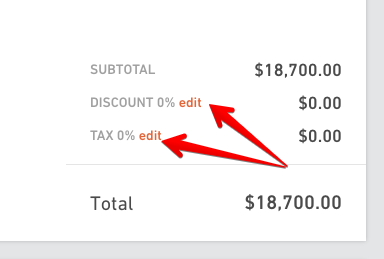 If you want to add discount or tax, click on the edit link next to these two items. If you added discount to a budget it will transfer to an invoice automatically and will be displayed here. Grab the line item you want to move and move it to another position. Click on the trash button next to a line item if you want to delete it from the invoice. Don't forget to hit the Save changes button in the bottom of the screen after editing or deleting. Does making changes to an invoice affect a budget? Nope. Nothing you add to an invoice will be shown in a budget. If you add some extra line items to your invoice, that won't make new services in a budget. If you add, change or remove a discount, that won't be shown in a budget. If I change something in a budget? Is it going to show automatically in an invoice? Once you create an invoice, that’s final and nothing you change in a budget will have an affect on an invoice. If you want to change something, you will need to go the invoice and make changes there.